So you'd think with nearly complete freedom to design and implement a top-notch lateral locating device for this live axle car, one would choose a Watts link right? After all, a Watts offers perfect symmetry when turning left and right, and doesn't move the axle laterally as the suspension moves through its range of travel. There's a couple imperfections with the Watts however. The first pertains to the above choice. If you choose the axle-mounted center pivot, then you get the "advantage" of a consistent roll center height. But half the world will tell you you're an idiot, because the sprung mass of the car moves in squat and pitch, so the "lever arm" from the roll center to the center of gravity, changes during squat and pitch, dynamically altering the rear roll couple. Plus it's harder to adjust. So you can instead choose the chassis-mounted pivot. This keeps the roll couple more consistent as the car pitches and squats. But now you've got to build a big heavy structure to support the center pivot, plus...wait a second, maybe the roll couple changes from the diff-mounted center pivot (loose on entry, tight on exit) could be beneficial? By now the other half of the world thinks you're an idiot for having done a chassis-mount Watts. 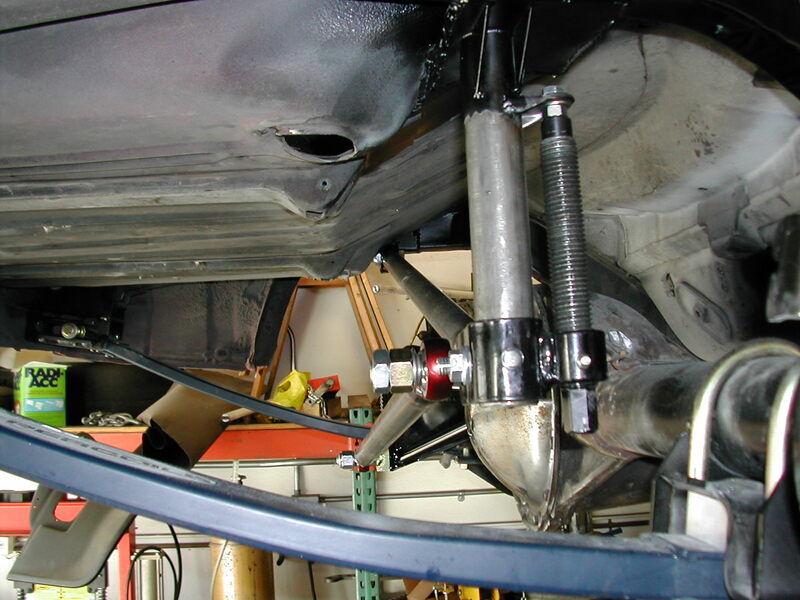 We won't even talk about a Mumford link, which might be cool if you're scratch designing a live-axle chassis, but on something like the Camaro it would take 40+lbs. of structure welded into the rear to support it. In keeping with the style of a person building a 44 year old car for a Street Touring class, I've made the choice that lets everybody (not just half) think I'm an idiot - a panhard rod. Now, we all know the downside of the panhard - it moves the axle laterally as the suspension moves. The shorter the panhard, the more movement. The panhard bar on the car now is about 34" long, which is as long as it could be made when considering the packaging restraints of the leaf springs. Another mitigating factor is, as with the front, by keeping the rear suspension stiff, I'll be able to minimize the vertical (and thus lateral) movement of the rear axle. 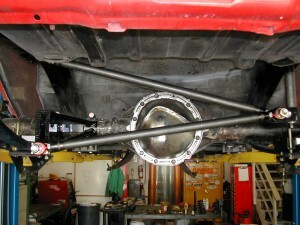 At 2" of travel (pretty much all it will get), the axle will shift laterally by only .06", about 1/16". This is not a completely negligible amount, but I plan to run tall-ish sidewall rear tires, which will mask much of this, and we see tires move around on their wheels by 1/2" or more while under heavy load. 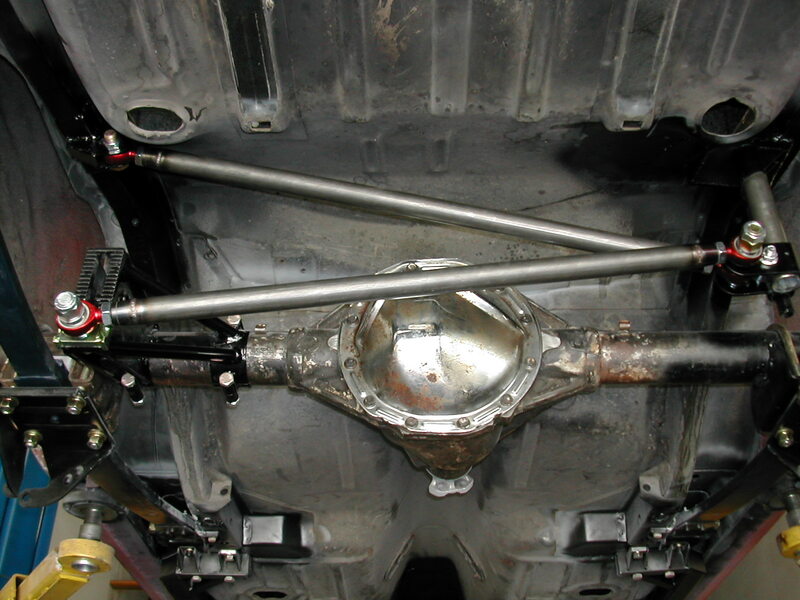 The other maligned characteristic of a panhard rods vs. Watts, is their asymmetry in handling. The roll center, usually defined as the bar's midpoint, rises or falls based on which way you're turning, and which way you have it mounted. This will always create a difference in the way the car behaves turning left vs. right. Even if you start with the bar horizontal at resting height, as the car rolls, the lateral forces fed through the now-non-horizontal bar will serve to load the rear axle differently depending on which way you turn. On the surface this may seem like a bad thing, but it can be used to counteract other asymmetries. For instance, in a live axle rear car, on hard acceleration, driveshaft torque is going to tend to weight the driver's rear tire, and unload the passenger rear tire - that's why you always see drag racers mounting their battery in the right rear, and why live-axle cars usually have such a bad time putting down power out of right-hand turns. This car is going to be making good power with good gearing so when good grip is available, this asymmetrical loading can become very significant. We can use the panhard to counteract this asymmetry somewhat, by mounting it to the left half of the axle, and to the chassis on the right. This puts the panhard in compression, when in a right-hand corner. That compression is going to help better load the rear axle in right-hand turns, counteracting some of the axle's natural asymmetry. And actually, there's a lot that's asymmetrical about any race track, and any Solo2 course - both are either clockwise or counter-clockwise (ProSolo, with its mirrored courses, is the exception). The panhard rod is unique in that it allows one to adjust-in some inherent asymmetry, that may help if a particular event features a strong abundance of key turns in one direction or the other. It's also lighter and less complex than the other options. My panhard bar is simple but should be very effective. The sawtooth axle-end adjuster and screw-type chassis-side adjuster supply an essentially infinite number of discrete adjustment postions, as opposed to the 4-5 "holes" most solutions offer. The solution overall is only about 16 pounds, a good bit lighter than the Watts options I've seen out there. 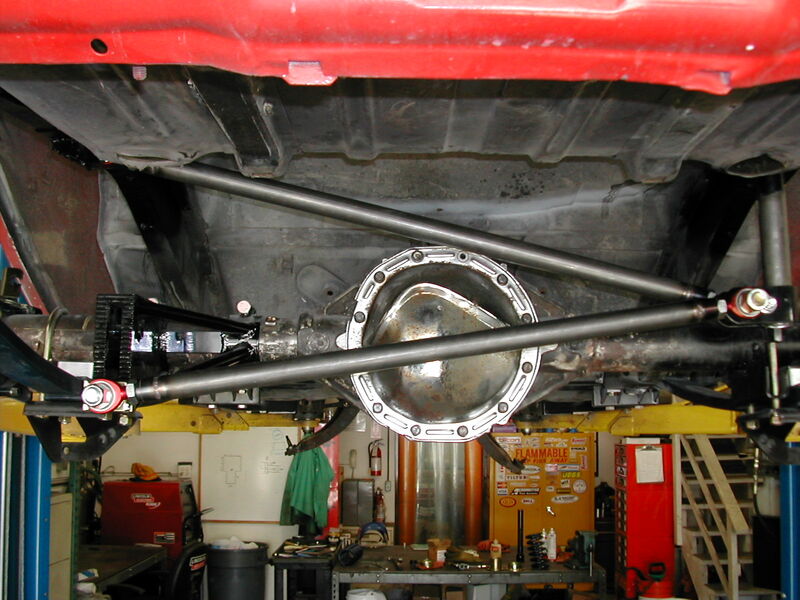 Only about 6 pounds of it is unsprung weight, and the axle-side mount (all unsprung) will be lightened a bit - it's designed to be bolt-on to the axle, but by welding it on, can eliminate the weight of the bolts and some other unneeded structure, while actually making it stronger. Man that screw adjusting system for the panhard is a nice idea. Is this an off the shelf system that has been modifed? Or is it all built from scratch? 46-1600 and 46-1651. Some fab is needed for the vertical tube and to provide the chassis-side mount point for the lateral brace.